I'm still working on the never-ending orange socks. Argh!!! It's like I'll never finish them! But actually tonight I can see the end. 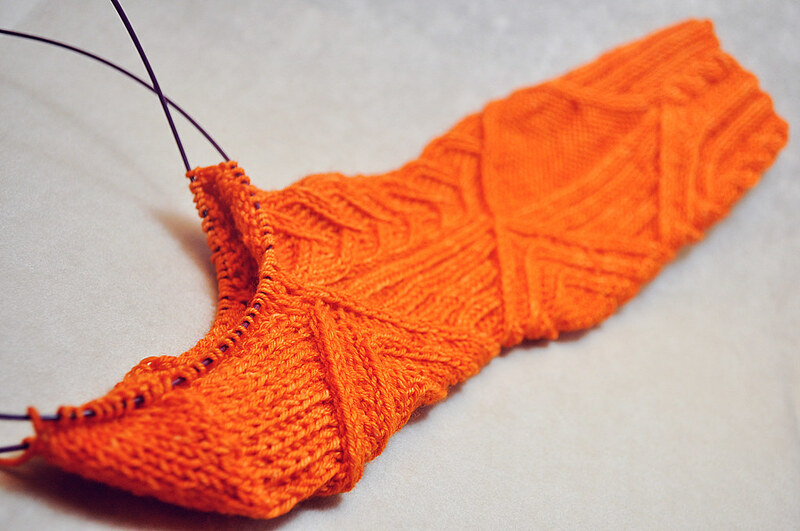 I only have another inch or less before I get to start the toe decreases. Hopefully I'll have an FO post for them this week! This picture is from a few days ago so it looks like I did better than I thought this week. Ainda estou labutando nas minhas meias sem fim. Argh! Parece que nunca vou terminá-las! Mas na verdade já estou conseguindo enxergar o final. Só falta menos de 3cm para que eu possa começar a diminuir pra formar a ponta dos dedos. Quem sabe tem um post de FO delas essa semana. Essa foto foi tirada há uns dias atrás e pelo jeito eu progredi mais do que me parece. And even though I have taken cosmos off yet, I will finish off with an old green manicure I did a while ago because it is Saint Paddy's day today and even though I didn't (or ever do) anything special to celebrate it, it feels right. E como ainda não tirei o cosmos dos dedos, vou terminar com uma manicure antiga. Mas como ela é verde e hoje é dia de São Patrício me parece a coisa certa a fazer. Two coats of High Line Green + one coat of Enchanted Forest + top coat = lovely grassy green. Duas camadas do NYC High Line Green + uma camada do NYX Girls Enchanted Forest + top coat = verde grama maravilhoso. It's a beauty, so it is!